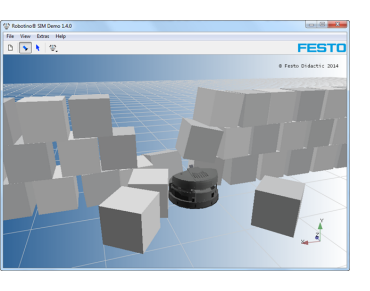 Robotino® SIM is a simulation environment for experimenting with Robotino®. Robotino® SIM provides you with a virtual Robotino® in an exciting, virtual experimentation environment. It allows you to control the Robotino® with Robotino® View, and takes you on exciting adventures – free of charge for first-time users!